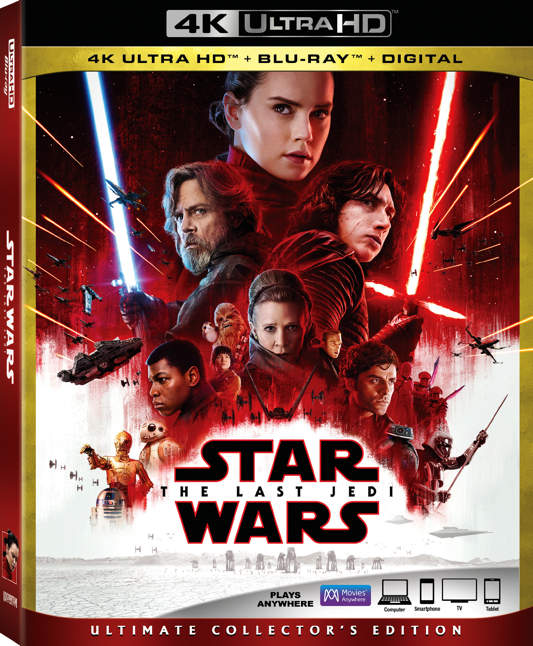 ‘Star Wars: The Last Jedi’ 4K UHD Announced and Detailed! Disney and Lucasfilm are bringing ‘Star Wars: The Last Jedi‘ to 4K and UHD, as well as Blu-ray, DVD, and digital streaming. The film will have a Dolby Vision image and HDR10 along with a Dolby Atmos audio mix. Needless to say, I can’t wait. You’ll be able to watch the film on digital streaming on March 13th and then be able to purchase the actual discs on March 27th. This is the first release from Disney that will feature both Dolby Vision and Dolby Atmos, and what a way to debut it is. In addition to these technical specs, there will be 14 deleted scenes that have never been seen before as well as some behind the scenes, and audio commentary. I just can’t wait. Below is the full details of what you can expect on the release. This entry was posted on Wednesday, February 21st, 2018 at 3:39 pm	and is filed under Film, News. You can follow any responses to this entry through the RSS 2.0 feed. You can skip to the end and leave a response. Pinging is currently not allowed. « Media-Ocrity #72 – Pulp Fiction Re-Cast, 90’s Music, Hasbro Toys, and More!